When buying a home here, be aware of the property tax rates for Manhattan Beach. For fiscal year 2018-19, the property tax rate is 1.1185679%. 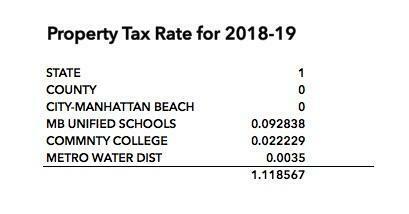 As you can see, neither Los Angeles County nor the City of Manhattan Beach imposes additional property taxes. The rate is up about 2 hundredths of a percent since FY 2016-17 (+0.024448). On a sample purchase of $2,000,000, this tax rate would result in property taxes of $23,713 per year, or about $1,976 per month. Under California law (Proposition 13), the assessed value of a property may increase by 2.0% per year. When property values decline, the assessed value can be challenged by a homeowner appeal, or may be reduced by the LA County Assessor automatically without such an appeal. Measure C is a $114 million measure that will be used primarily to improve infrastructure at elementary schools (including completing air conditioning for all classrooms), replace the Ladera campus at Grand View, and make improvements to each elementary site. Measure C received 71.4% of votes in favor, with 55% required for passage. 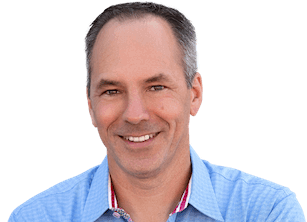 It is estimated to add $22.00 per $100,000 in assessed value to a typical homeowner's tax bill, though this may change slightly. Measure EE is a $39 million measure to replace the outdated and undersized gymnasium at Mira Costa High School. Measure EE received 67.4% of votes in favor, with 55% required for passage. It is estimated to add $8.00 per $100,000 in assessed value to a typical homeowner's tax bill, though this may change slightly. On June 5, 2018, the voters of Manhattan Beach approved Measure MB, a parcel tax dedicated to school funding. Measure MB levies a $225 per year per parcel tax for 6 years. The parcel tax is expected to raise about $2.6 million per year for local schools at a time of declining state funding. The measure received 69.25% support from the voters.